Father, to whom are you going to give me as gift? .... To whom ..to whom? " frusted by his father's cunningness Nachiketh asked his Dad. Dad utters in rage, "I give you to the lord of death ''. Vajashrava was the father of lad Nachiketh, desiring a gift from the gods, started an offering to donate all his possessions. But Nachiketa noticed that he was donating only the cows that were old, barren, blind or lame and stale grains to poor guys. Knowing all these Nachiketh questions his father Vajashrava ..
Lad Nachiketh goes to Yamaloka as the result of his Dads angered words. After going to Yamaloka he waits for three days in hunger to meet the head of the hell. Finally arrived Lord grants him three boons for waiting in hunger for three days. 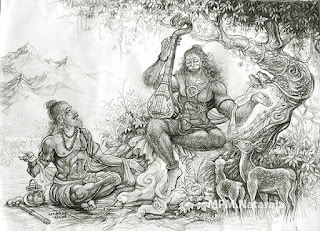 Lad Nachiketh requests as first boon to him, '' My father should be relieved of his anger and he should become a peaceful and contented person "
Lord says with smile "All right, your father will be at peace with himself henceforward". 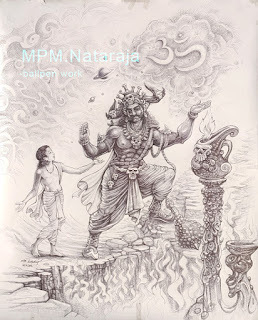 The second one Nachiketa wished to learn the sacred fire sacrifice, which also Yama elaborated. And "what is third wish little dear?" lord smiled agian. He recollected that one-day at the Gurukula Ashram, he was weeping over the death of a cow. He said aloud to Lord Yama, "Lord! Every living being in the world is mortal. They go through a cycle of happiness and grief in accordance with their meritorious work or sin. It is said that even if the body dies, the soul remains eternal. So there are cycles of births and deaths. What is the secret of this? Are there no ways and means of overcoming this grief? Kindly let me know if there is one. This shall be my third request. " Yama noded his head, "dear tiny star, this had been a mystery even to the gods. Oh Nachiketa ask for some other boon "and he even induced him many material gains like ... kingdom ... wealth ..whatever you desire .. Instead, he stood with his words as mount and replied that material things will last only till tomorrow. He who has encountered Death personally, how can he desire wealth? No other boon would do. Yama was pleased with this disciple and secretly elaborated on the nature of the true self (atma), which persists beyond death. Nachiketh was sent back to the earth with many devine glories. he was melt in into the trance of time..
which are holding ocean of compassionate soul .